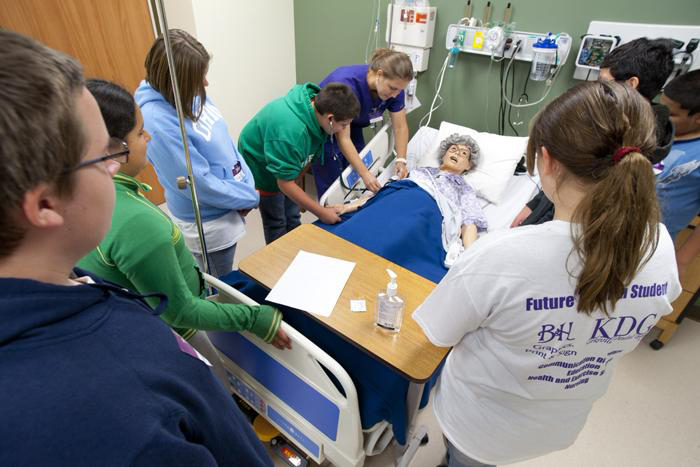 A Truman student helps a group of middle school students in the Nursing Lab in the Health Sciences Building. Last October, approximately 120 seventh- and eighth-grade students from Green City, Mo., and Milan, Mo., spent a day touring the Truman campus and attending presentations from Admissions, ROTC, Upward Bound and the School of Health Sciences and Education departments. The programs provided students with information about topics of their interest in health professions and education and possible careers in the fields. Members of the School of Health Sciences and Education dean’s team facilitated the day.